Symptoms are the body’s way of showing all is not well. They are not a problem in or of themselves. The general public is not aware of this. The medical profession has no idea of this or of the concept of health. So they get busy suppressing the symptoms. Suppression of the symptoms of a body can seem to be curative in the short term, as they often disappear. However, in the long term, they cause a catastrophic effect on the general health. To understand this condition, you have to understand health, or should I say natural health? The skin is the least important organ of the body, so is used by anybody as the first avenue to release the pressure build up of poor health. When I say least important, I mean it has the least impact on the body when it is used this way. The impact is far higher to the health of the body if this load is released through the kidneys, the liver or the heart. Then it can become life threatening. 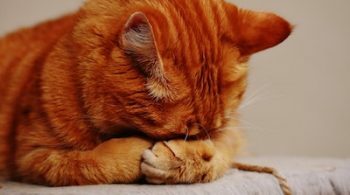 So cats skin problems are showing you that your cat has a health problem, but is dealing with it in a very healthy way. If you like, their health has only dropped by one notch. Why does the body do this? Health problems stem from two major areas. One is deficiency (ie a lack of quality, species-specific nutrition). And the other is toxicity. Of course it is possible, and sadly common, for both to be present in the modern cat (or dog or you). Toxicity is a major problem today. Toxins abound in the air, the food, medication. But the two really problematic areas are the food and the medications. Commercial cat food has nothing to offer in the form of quality nutrition or species-specific nutrition. It is cheap ‘food’ masquerading as healthy. It has many added chemicals to try to improve the poor quality. All these do is to increase the toxin load on your cat. Medications, including vaccine, are all chemicals. The common chemicals in vaccines include mercury and aluminium, two neurotoxins most of us are trying to avoid. The levels are far higher than recognised safety levels. 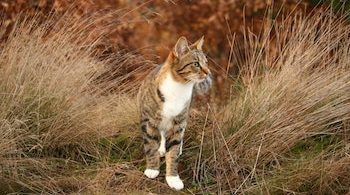 Skin problems in cats start when these toxins are too high for their normal excretion through the urine, and the small amount cats sweat – through their paws. Cats don’t naturally drink much, so this adds to the elimination problem; they can’t flush the toxins out as easily as we do. 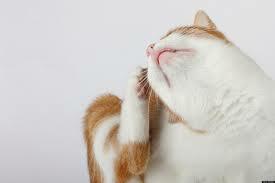 Toxin elimination can take any form of skin conditions in cats, from eczema to dermatitis, to acne, to boils, to anything. It all depends on the personal quirks of the cat, their health history, their parents, etc. So, you take your cat to the vet. They are as blissfully ignorant as most people, of what is really going on. After all they sell these foods, these medications. It would be a quantum leap for them to change and most can’t entertain the idea. So they deny it. Along come the antibiotics, the hormonal treatment, the steroids. All these measures simply increase the toxin load. They suppress the symptoms. They do nothing to cure the cause of the problem. And they do everything to cause major, life threatening problems down the track. 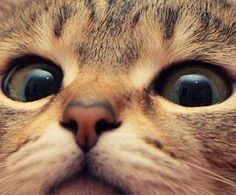 When you understand the cause of cat skin problems, then you are in a position to help your cat recover. Often fully. You start by feeding them according to how they evolved. Step number one. Absolutely essential. Everything else is secondary. A healthy, natural diet increases the health of the immune system, making it much more efficient at dealing with problems. It increases their nutrition in a way nothing else can, whatever the claim. Health in a young cat can be restored quickly, if there have been no other complications. An older cat’s health may take longer to recover. No quick fix here. Just the slow, curative fix. The second step, alongside the first, is to stop all veterinary medications (unless absolutely essential), including the common worm and flea preparations. A healthy cat is immune to disease. A healthy diet prevents worm and fleas infestations. Be very sure that Nature is already perfect, that man creates most (perhaps all?) disease in domestic animals. 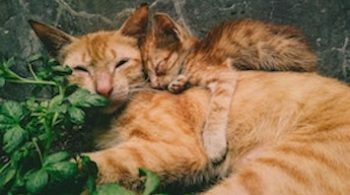 Some cat skin conditions may need extra help, especially in an older cat, one with an existing condition or a young cat that has had challenges – such as lack of food, taken from the mother too early, abandoned, taken to a shelter, etc. Use holistic health care, such as homeopathy, that works by eliminating the cause rather than suppressing the symptoms. Natural cat health is far superior to anything manmade. Nature has no ego or profit agenda. My introduction to homeopathy came from a cat I once had, with eczema. Most drugs did nothing to help the eczema. One did, at the expense of her behaviour, her mood. Countless visits over the years. One consultation with a homeopath fully, completely and permanently healed the eczema with no detrimental effect to her long term health. I am so grateful to her. She lit the way forward for me. Let your cat skin problems light your road ahead. They give, unconditionally. All we have to do is to recognise the giving, receive it gratefully and learn from it.